In one corner, we have the believer that power supplies are out of the signal path; in the other, that power supplies are everything and amplification components nothing but signal-modulated supplies. If power supplies were truly outside the signal path, how come overkill supplies routinely trump squarely adequate ones? Why does Synergistic Research's Enigma power supply for their Tesla cable's active shield make a clear difference when it is switched between two different vapor rectifiers? At least to conventional thinking, that really ought not to have any impact. Yet even Stereophile editor John Atkinson heard it plain as day during a public demonstration. Dan Wright at ModWright might believe that both viewpoints are right but neither in possession of the complete picture. With his PS 36.5 external power supply for the LS 36.5 remote-controlled 6H30-based line stage though, he clearly has placed his bet. Power supplies make a difference. Overbuild, separate and go deep into mono: two power transformers, two chokes, two tube rectifiers, two 6EA7/6GM7 voltage regulators, a discrete relay control transformer, a discrete filament transformer for the voltage regulation tubes, all enclosed in a separate but matching enclosure. This receives AC from the wall via single cord, rectifies and smoothes it and then passes it along as discrete voltages to be processed for actual sound in the LS 36.5 control chassis via a "ROHS-compliant, mil-spec Amphenol connector with threaded sleeve connection. It's a serious umbilical connector, more than 1 inch in diameter and just hell for stout." 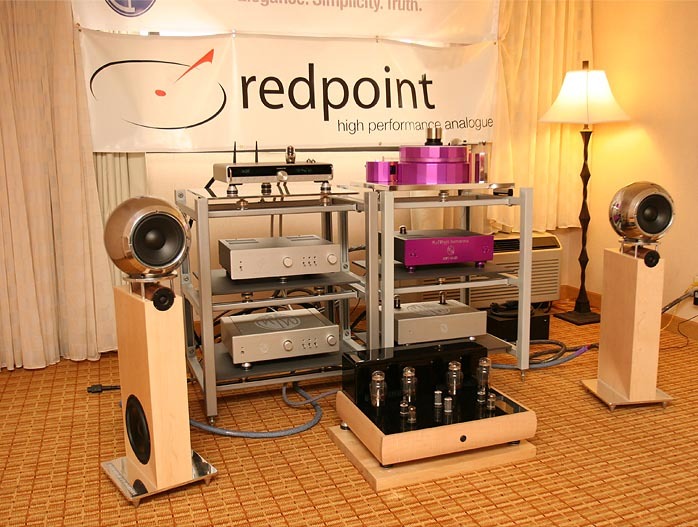 The fully duded out, maximally mono-ized LS 36.5 first showed at RMAF 2007 with Red Point (vinyl), Art Audio (Vivo 300B p/p amplifier), Studio Electric (speakers) and Acoustic Zen (cables). When news of the PS 36.5 spread post show, ModWright found itself quickly back ordered. Having long since subscribed to the very secretive "Leave No Reviewer Behind" household-subsidized upgrade program, I too signed up to get my personal LS 36.5 retrofitted. "It truly elevates the performance of the 36.5, I believe, to a degree that matches the improvement going from the 9.0SE to the 36.5. The improvements with the outboard supply include much better separation, imaging and a bigger and more detailed soundstage. The bottom end and weight of the presentation is much greater with very fast, deep, tight and controlled bass. The stereo separation of course is attributable to the dual mono design. By using two transformers, the current load on each transformer is halved, allowing for greater current availability to the driver tubes which results in greater body and bottom end extension and punch. The unit exposes the vacuum tube rectifiers to allow use of the 5AR4/GZ34, GZ37, 5U4G, 5U4GB, 5V4, 5V4GB and their variants. Lastly, the use of discrete tube voltage regulators allowed for greater control, speed, transients, microdynamics and detail." Thus promised the Dan man. Having explored no preamps and passives, I've come around to believing than in the vast majority of cases, a premium active preamp (premium meaning valves) is essential. Its contribution is akin to signal conditioning of the sort we expect from an injection of current and greater voltage swing potential. My favorite preamp in that regard has been the Supratek Cabernet Dual from Oz, a $5,000-direct two-chassis affair with tube rectifier, tube regulators and two discrete transformer-coupled valve outputs for high (101D) and low (6H30) bi-amping. Alas, the Supratek power supply runs very hot and the innards of either box are tangled snake pits with hot-glued capacitor mountains. By comparison, the ModWright 36.5 has always been a poster child for inner law and order. 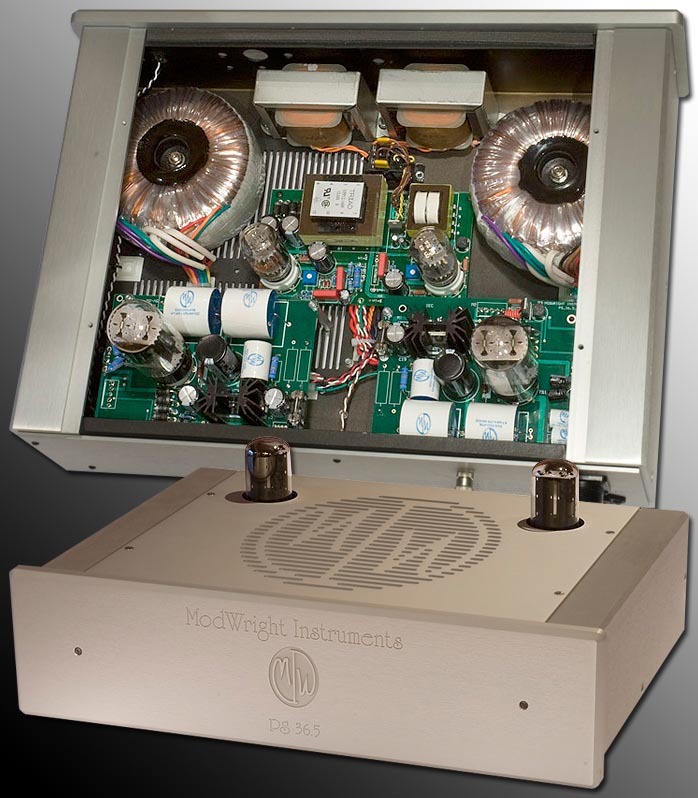 If I could only have one preamp, I'd want the midrange and treble ravishment of the Supratek and the immaculate assembly standards of the ModWright.